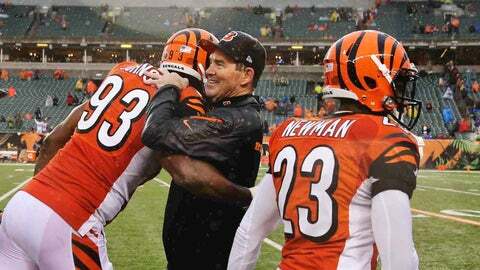 Cincinnati Bengals defensive end Michael Johnson (93) hugs defensive coordinator Mike Zimmer during the game against the Cleveland Browns at Paul Brown Stadium. Cincinnati won 41-20. CINCINNATI — Maybe I approached Bengals cornerback Adam Jones the wrong way after Sunday’s win against Minnesota. 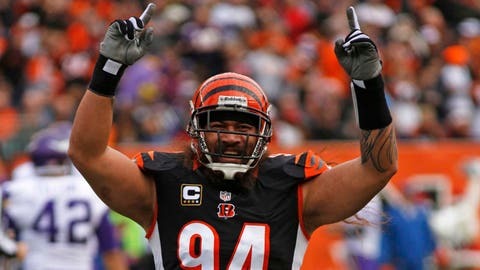 The Bengals had just finished off a 42-14 beating of the Vikings. Minnesota gained just 209 yards of offense and didn’t convert any of the nine third downs it had or the two fourth downs it attempted. The Vikings had put up 48 points and 455 yards against Philadelphia the week before and even though it’s been a less-than-stellar season for them, they’re a team that has played good football over the last month. The Bengals’ defense made the Vikings look like a 4-10-1 team Sunday. It doesn’t take a rocket scientist — and I’m no rocket scientist — to see that defensive coordinator Mike Zimmer’s unit stepped up its game after a sub-standard performance in the second half against Indianapolis two weeks ago and then against Pittsburgh last week. "Why do you keep saying that? We had one bad tackling game. We haven’t been tackling bad the whole season," said Jones. "We’re the most physical team in the NFL. We had one bad game tackling." That’s why the second half against the Colts and the game against Pittsburgh were so noticeable. The Bengals weren’t awful defensively against the Steelers. A lot of their numbers were good; the Steelers jumped out to a 21-0 lead because of Cincinnati special teams mistakes but managed just three field goals the last three quarters. Yet, there also weren’t any momentum-changing plays that have become commonplace expectations of this defense. The standard of playing defense for the Bengals is way up there. It’s been talked a lot over the years about what it took to play defense for Pittsburgh or Baltimore. These are the kinds of standards the Bengals have for themselves. It’s not a comparison to the Steelers or Ravens; the standard now is their own. "Our motto here is being physical and tackle," said Jones. "We don’t have corners who guard receivers like other teams. We have to tackle and Zim don’t allow us not to tackle. Marvin (Lewis) either. We tackle. We had one bad week of tackling. It’s not like we haven’t been tackling all season." It didn’t take a rocket scientist to see that on Sunday against Minnesota the Bengals were back up to that standard. "Our expectations are pretty high. We’ve got good guys on the team that know and take pride in doing things the right way," said Zimmer. "Sometimes you get out-athleted, it happens. When you’re not in the proper position you give a player like (Adrian) Peterson or Antonio Brown a lot of room in space, they should win. It’s like one-on-one in basketball. The guy is going to have chance to win. It is being in the right position, knowing where your help is and we did a nice job of that." The Bengals held Peterson, Minnesota’s All-Pro running back and owner of a rare 2,000-yard season a year ago, to 45 yards on 11 carries. Peterson is hurting with a bad foot but the Bengals never let him get any traction and he was never a factor in the game. When he had the ball, he had a lot of guys wearing stripes on their helmets around him. As defensive end Michael Johnson explained it, if you see a team repeatedly having to make one-on-one tackles, then you’re seeing a team that isn’t playing sound defense. The Bengals have played a lot of sound defense this season. "There’s an attention to detail to everything we do," said Johnson. "You may not understand that, and that’s okay if you don’t understand that. It’s really not for you to understand. Just sit back and watch and enjoy it." Zimmer joined the Bengals in 2008. The defense has been ranked no lower than 15th in total yards, including three seasons in the top seven. They’re No. 5 in that category going into this Sunday’s final game of the regular season against Baltimore. Those are good numbers but there is an attitude and process that produces the numbers season after season. "It all started in 2008. That’s when we started to play good defense," said defensive back Chris Crocker, who joined the Bengals mid-season that year. "It’s no coincidence that’s when we started this whole thing. That goes to show (Zimmer) is a heck of a coach. You can’t discredit that. Whether people love him or hate him, he’s a good coach." You’ll be hard-pressed to find anyone inside Paul Brown Stadium that doesn’t love Zimmer. He’s respected because of his honest, forthright nature with everyone. There is nothing phony about him. Zimmer has different styles of talking to every player but the message is clear no matter how it’s delivered: this is what we do, this is what we expect, so go out and play it this way to the best of your ability because that’s why you’re on the team. He’s gotten great play from veterans like Crocker, Jones, Terence Newman and Wallace Gilberry — players that other teams didn’t want or thought were finished being productive players for one reason or another — and the players the Bengals have drafted or signed as undrafted free agents since his arrival. This could be Zimmer’s last season with the Bengals. There will be job openings this offseason and he’s sure to get interviews. His style might not suit every owner or every team but they have fit perfectly with the Bengals. It’s given them a new standard.